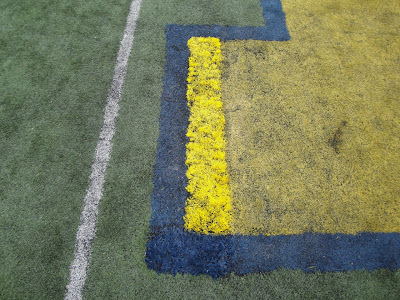 At the end of March, vandals broke into Michigan Stadium and cut a six foot by eight inch piece of turf out of the Block M at midfield. The section was replaced for the spring game with a brighter and higher quality version of field turf called Duraspine. All the turf at Michigan Stadium will be replaced following commencement. 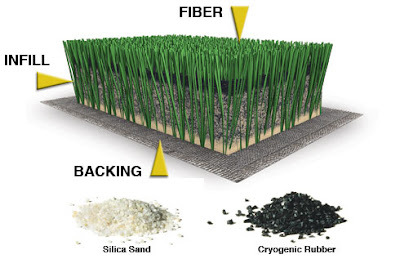 The eight-year-old field is one of the first versions of FieldTurf and will be completely replaced with Duraspine by the season opener against Connecticut. The L-shaped strip of the block-M that was torn out was replaced with the new Duraspine turf that will cover the whole field this fall. Clearly, the yellow is yellow-er, the blue is blue-er, I assume the green will be greener-er, and just the whole look of the new turf is thicker and stands a little taller than the old, trampled worn-out turf that clearly needs to go. This is obviously just a patch-job, and I assume the whole field installation will look much more uniform. Long story short: Yes, new turf this fall. It's way more super-awesome than the old turf. It will be safer, with more vibrant colors. I assume it will be green...but who knows, it could be blue. It might have a new design. In an email sent to media relations, Bruce Madej only confirmed the new turf, and did not address whether or not any changes would be made to the design of the field. We'll just have to wait and see. I wonder if this Okanagan turf installation will make a substance that is close enough to grass to pass.